There are several key points to this film which really remind me of the movie Limitless, and it�s not just because of its name. In both films, fringe science unlocks something incredible for the main protagonist, but also opens the door to something really dark once the protagonist breaches its chrome and shiny surface. In both films, the main character is a person full of energy and the will to live, but who is somehow bound to their current, undesirable state � in Limitless, it was the lack of professional drive that kept its main character down. 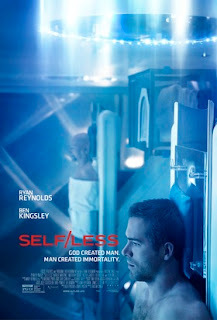 In Self/less, the main character is Damian, an incredibly wealthy old man who is coming to the end of his natural life. But Damian can�t accept the notion of mortality that easy, so he seeks a company offering a chance to start all over, using a device that transfers his mind into a new, synthetic body, grown from scratch. With death being the only other alternative, Damian decides not to shuffle off his mortal coil and accepts the offer of Professor Albright, who�s classic style for fashion is only eclipsed by his thinly wielded evil interior, which the film foreshadows way too much. At the moment of the switch, the character of Damian passes from Ben Kingsley to Ryan Reynolds. While Kingsley is in the driver seat, the film possesses a nice aura of mystery and intrigue, because the veteran actor does presents really well powerful characters which are dislikable but understandable. Here, Damian�s struggles with missed opportunities and grim possibilities, and Kingsley makes it works. The director Tarsem Singh makes the introduction in a subtle but engaging fashion, making the audience invested in Damien�s plight. But, once the transition takes place and Reynolds becomes Demine, Self/less just loses it. I like Reynolds, especially his comic talent, but here, he simply melts into the bland surroundings in which the film takes place from that point on. Damian moves to New Orleans, but the film quickly ends up being filmed in plywood houses in the suburbs, small country roads and abandoned warehouses turned secret medical labs, as if the scenes from affordable actions movies like Bangkok Dangerous were suddenly offered to Singh at discount prices. Like the predictable story and uninteresting twists, from that point on, Self/less glides into a really mediocre thriller. This final element really makes the film a spiritual continuation of the equally flawed Limitless.